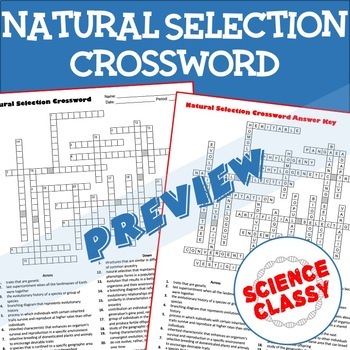 This crossword puzzle is an excellent review of challenging vocabulary related to natural selection and evolution. 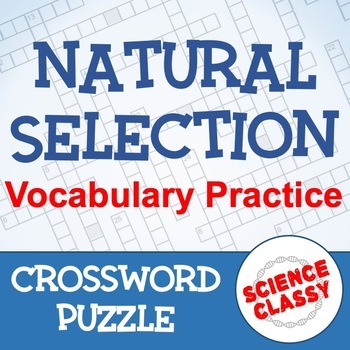 Students need practice with identifying the key vocab, plus a crossword provides a round of practice with spelling! Correct spelling can be tough with challenging academic vocabulary! Crosswords can be used as individual practice at home, bellringer or closure work, or even turned into a review game race (ex. students on a team must take turns writing in a word - fastest team wins!). For single classroom only; not to be shared publicly. ~ . ~ . ~ . ~ . ~ . ~ . ~ . ~ . ~ . ~ . ~ . ~ . ~ . ~ . ~ . ~ . ~ . ~ . ~ . ~ . ~ . ~ . ~ . ~ . ~ . ~ . ~ . ~ . ~ . ~ . ~ . ~ . ~ . ~ . ~ . *Follow the Science Classy Store! Click on the green star next to the store logo to receive upcoming sales, freebie and product launches, and email updates! *Get TPT credit for future purchases! Go to your "My Purchases" page. Next to each purchase, you'll see a "Provide Feedback" button. Simply click it and you will be taken to a page where you can give a quick rating and leave a short comment for the product. Each time you give feedback, TPT gives you feedback credits that you may use to lower the cost of your future purchases.